The HAWC gamma-ray observatory detects cosmic rays from its altitude of 13,500 feet in Mexico's Pico de Orizaba National Park. The Sierra Negra volcano looms large in the background. More antimatter particles stream toward Earth than scientists can explain — and new research from a mountaintop observatory in central Mexico deepens the mystery by crossing off one possible source. The Earth is constantly showered by high-energy particles from a variety of cosmic sources. Physicist Victor Hess used a balloon to provide the first evidence of the extraterrestrial nature of cosmic rays in 1912. Since then, scientists have identified and accounted for a variety of different types, but the origin of some of these particles continues to elude experts. After years of work, camps coalesced around two distinct explanations, according to a statementby Michigan Technological University, which was involved in the new study. One hypothesis suggests the particles come from nearby pulsars, rapidly spinning cores of burnt-out stars, which can whip particles like electrons and positrons to incredible speeds. The other group posits a more exotic origin for the excess positrons, perhaps involving dark matter, an unknown yet pervasive entity that accounts for 80 percent of the universe's mass. Particles like positrons that carry an electric charge are difficult to detect on Earth since they can be deflected by the planet's magnetic field. But scientists have a workaround. The particles also interact with the cosmic microwave background — an ever-present stream of low-energy photons left over from the birth of the universe. "The high-energy electron, or positron, [will] kick the low-energy photon ... so this the photon becomes a high-energy gamma-ray," Zhou said. "These gamma-rays, which have no electric charge, can pass right through the magnetic field and make it all the way to Earth's surface. Zhou's team made detailed measurements of the gamma-rays coming from the direction of two nearby pulsars — Geminga and its companion PSR B0656+14 — that are the right age and distance from Earth to account for the excess positrons. To do this, the scientists used the High-Altitude Water Cherenkov (HAWC) Gamma-Ray Observatory, located about 4 hours east of Mexico City. HAWC comprises more than 300 tanks of extra-pure water. When gamma-rays plow into the atmosphere, they create a cascade of high-energy particles. 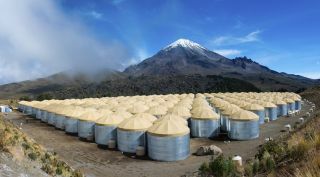 As this shower of particles passes through HAWC's tanks, it emits flashes of blue light, which scientists can use to determine the energy and origin of the original cosmic ray. The data from HAWC revealed that particles are streaming away from the pulsars too slowly to account for the excess positrons, according to a statement by the University of Maryland, whose researchers also contributed to the work. In order to have arrived here by now, the particles would have needed to leave before the pulsars had formed, Zhou said. Zhou's colleagues are quick to point out an important caveat. "Our measurement doesn't decide the question in favor of dark matter, but any new theory that attempts to explain the excess using pulsars will need to match the new data," University of Maryland physicist Jordan Goodman, the lead investigator and U.S. spokesman for the HAWC collaboration, said in the statement from Maryland. By observing the rotations of galaxies, scientists determined that the universe contains more mass than the objects we can observe. They call this mysterious extra mass dark matter. Aside from seeing dark matter's gravitational influence from afar, no one has directly detected it otherwise. However, a popular model of the substance involves weakly interacting massive particles, or WIMPS, which interact with regular matter solely through gravity. If these proposed particles were to decay, or be annihilated somehow, they could conceivably generate pairs of electrons and positrons, Zhou said. There are other astrophysical processes to consider as well. Supernova remnants and microquasars — extremely bright objects formed as matter spirals toward a black hole — can produce positrons, Zhou said. And there's the possibility that the initial model of particle interactions with the cosmic microwave background is inaccurate. "In order to confirm a detection of dark mater, I guess, there's still a long way to go," Zhou said. "We have to rule out all these astrophysical processes." Zhou's team plans to take advantage of HAWC's incredibly wide field of view to narrow down these alternatives in future studies. Email Harrison Tasoff at htasoff@space.com or follow him @harrisontasoff. Follow us @Spacedotcom, Facebook and Google+. Original article on Space.com.